Rock climbing began to be practiced as a necessity in the Alps in the Victorian mountaineering age. Over time, rock climbing gradually evolved into an athletic sport instead of a necessary alpine practice. Generally, it is not considered as becoming a sport until the last quarter of the 19th century in at least three different regions; the Lake District of England, The Elbe Sandstone Mountains which are located near Dresden in Saxony, and in Italy in the Dolomites region. One of the earliest accounts of rock climbing being heralded as a sport occurred in England in the late 1880s after climber Walter Parry Haskett Smith made his well publicized first ascent of the Napes Needle. After this event an increasing number of people were attracted to rock climbing as a sport. In 1897, climber O.G. Jones hit an early benchmark approaching modern levels of difficulty with the the ascent of Kern Knotts Crack. A photo of the Naples Needle in a shop window in the early 1890s is what Jones said attracted him to the new sport. By the end of the Victorian era, during vacation periods, as many as 60 enthusiasts at a time would gather at the Wastwater Hotel in the Lake District. In 1887, a 17 year old high school student from Munich named Georg Winkler embarked on a solo first ascent of Die Vajolettürmeby. His climb encouraged the development and acceptance of the sport in the Dolomites. By 1903 there were an estimated 500 active climbers in the region of Elbe Sandstone. These climbers were inspired by the climbing of pioneers from the late 19th century such as Oskar Schuster. The 1906 ascent of Teufelsturm by some of the climbers set new standards of difficulty. There were over 200 small climbing clubs in the area by the late 1930s. 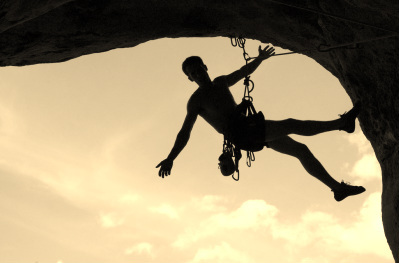 As the sport evolved, the equipment such as carabiners, harnesses, shoes and the climbing techniques climbers use have progressed in a steady fashion. As rock climbing progressed, in order to more accurately compare the relative difficulties of climbs, a variety of grading systems were created.